A welcome theme in the 2016 presidential election was a commitment to increasing public investment. Both candidates in the Democratic primary put forward detailed plans for such investments, and in the general election contest, Donald Trump generally criticized Hillary Clinton’s five-year, $275 billion plan for infrastructure as too small. Now that the election is over, it is time to translate these campaign promises into reality, and get serious about correctly diagnosing and fixing America’s chronic underinvestment in the roads, bridges, educational institutions and other things that make up the public capital stock. This policy brief makes a number of points that should inform evaluations of public investment plans issued by President-elect Trump and Congress. Public investment in the United States has lagged for decades. And net federal investment has actually been negative at times since the Great Recession, as the long-run downward trend was reinforced by sharp reductions in discretionary federal spending imposed by the 2011 Budget Control Act (BCA). This federal disinvestment has been amplified by state and local decisions to cut back investment. Infrastructure investment has predictably lagged with the broader public investment drought. As public investment has lagged, productivity growth has slowed markedly and private investment remains weak. The most reliable way policymakers can accelerate productivity growth is to step up public investment. Productivity growth is needed (if not sufficient) if we are going to raise typical workers’ wages. Productivity growth is a measure of the additional income generated in an average hour of work in the economy. Rising productivity provides the potential for pay increases over time. Other policies are needed to ensure that this potential translates into reality, but productivity growth is a crucial element of rising living standards. While public investment has clear long-term growth benefits, it can also provide a near-term boost to an economy that still suffers from insufficient aggregate demand. Despite some claims that the United States is near full employment, there is still considerable productive slack (workers and capital sitting idle) in the economy that could be taken up by a burst of public investment to boost aggregate demand. A policy effort to boost public investment should include a broad portfolio of investments. “Core” infrastructure investments—building roads, bridges, transportation systems, water and sewer systems, and utility facilities—provide high rates of economic return. But so do many categories of noncore public investments, such as improving early child care and childhood education and investing in renewable energy and health care. Many of these noncore investments—particularly human-services investments—are at least as neglected as core infrastructure. This is particularly true if one considers the low pay in these sectors that impedes the development of a fully professionalized and motivated workforce. Human services investments would provide at least as much as, or more of, a near-term boost to economic activity and jobs than core infrastructure. Human services investments unambiguously create more direct jobs per dollar invested. And while core infrastructure investments create more spinoff jobs (in firms that supply affected industries and in companies supplying goods and services purchased by new wage earners), human services investments still generate more total jobs. We should be extremely wary of claims about free lunches that can be had by providing a larger private role in financing infrastructure investment. A larger private role in financing infrastructure provides no efficiency gains, but opens up many avenues for crony capitalism, corruption, and rampant inequality of public investments across communities. A poorly constructed plan with no real safeguards will result in private-sector profiteering while radically blunting the amount of net new investment generated. This will in turn severely restrict the near- and long-term potential benefits of a public investment effort. As a share of the overall economy, public investment—government spending on the nation’s physical and human capital stock—has lagged considerably relative to its pre-1970s peaks. In the early 1990s, a number of researchers, led by economist David Aschauer (1989, 1990, 2000) identified a slowdown in public investment as a key source of the slowdown in overall productivity growth that plagued the U.S. economy after 1973. Another wave of researchers criticized Aschauer’s estimates of the effect of public investment on productivity growth, often on the simple grounds that they were “too large.” Some also criticized the first round of public investment research on technical statistical grounds. But what really led to the abandonment of a push for more public investment was the productivity rebound in the late 1990s. This productivity renaissance—which was led by private-sector investment in information and communications technology (ICT)—seemed to have solved the problem that more public investment was meant to address. But productivity growth has slowed since 2005, and this deceleration should put public investment back front-and-center. As private investment has lagged in the last 15 years (even before the Great Recession), the most reliable policy lever for boosting productivity growth is boosting public investment. 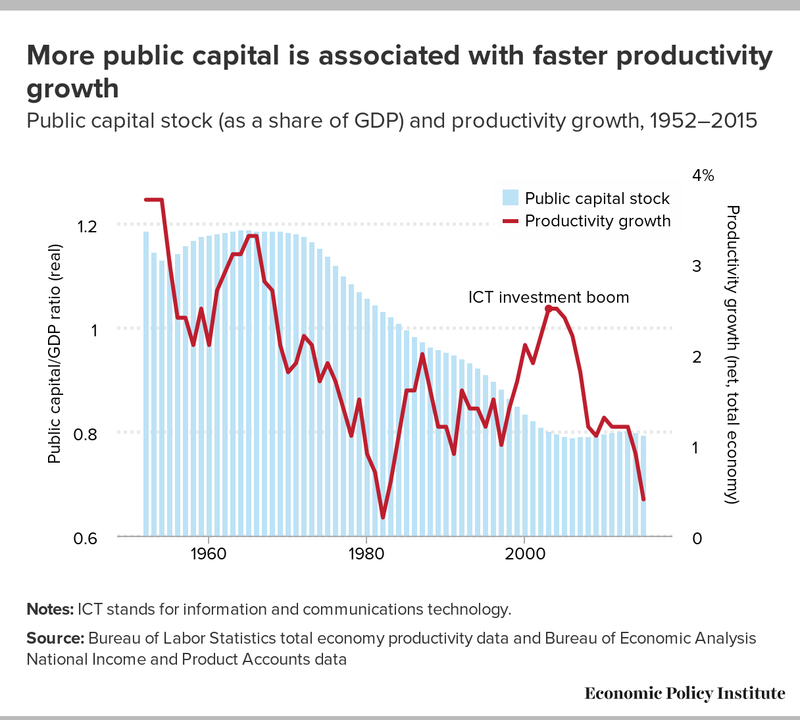 Figure A shows public capital stock as a share of potential gross domestic product (GDP), and productivity growth.1 The slowdown in public investment has led to a steady decline in the size of the public capital stock relative to the overall economy. Notes: ICT stands for information and communications technology. Data on productivity are from unpublished series on total economy productivity from the Bureau of Labor Statistics (BLS), available upon request. We adjusted the BLS measure to make it a measure of net productivity growth by stripping out depreciation from the output measure. Public capital stock data is from tables 1.1.7, 7.2A, and 7.1A from the Bureau of Economic Analysis (BEA) National Income and Product Accounts. To smooth out the volatile annual productivity series, five-year averages of both productivity and public capital stock/GDP ratios are used. Luckily, the most recent productivity slowdown has coincided with a resurgence of research showing that increased public investment could provide substantial gains in productivity. The new research—notably Heintz (2010)—addresses the technical criticisms of the earlier Aschaeur work yet still finds large effects. Bivens (2012a) reviews a range of the empirical literature on public capital and productivity and finds strong evidence that increasing the growth rate of the American public capital stock would significantly boost overall productivity growth. Besides boosting productivity in the longer term, increased public investment would also strengthen the American labor market in the near term by boosting aggregate economic demand. Strangely, many have declared that the U.S. economy has been nearly at full employment for essentially the past year, implying little short-run boost is possible from an increase in public investment that boosts demand. 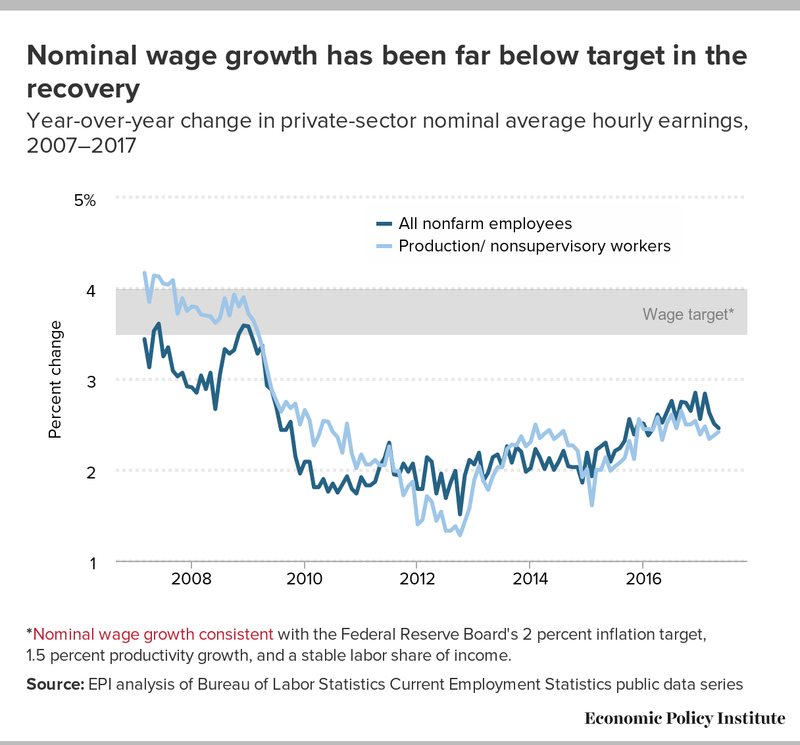 *Nominal wage growth consistent with the Federal Reserve Board's 2 percent inflation target, 1.5 percent productivity growth, and a stable labor share of income. Public investment can be roughly separated into two broad areas. “Core” infrastructure mostly refers to highways and other transportation facilities, water and sewer lines, and, sometimes, public utilities. One key reason why we have traditionally relied on the public sector to provide infrastructure is that many projects carry enormous upfront costs, but the marginal costs of providing services to additional users are very small. This tends to lead to “natural monopolies.” For example, once the New York City subway system was built, there was no serious way that a private competitor could make money by constructing a second subway system in New York City. Natural monopolies require accountable regulation and management. Given that substantial public oversight was always going to be necessary, moving directly to public financing often made sense. But other noncore forms of public investment also have the potential to provide large benefits, both by boosting demand in the short run as well as boosting productivity in the long run.7 Some of these noncore public investments could include providing resources for early child care and education, public health, and energy efficiency. The case for increasing noncore public investments is every bit as strong as for infrastructure. In fact, the rationale for noncore public investments may be even stronger in many cases because it is often harder for private-sector actors to claim economic returns on noncore investments than to claim returns on core infrastructure investments. For example, key economy-wide benefits of high-quality prekindergarten programs include the reduced likelihood that children in these programs encounter the criminal justice system when they grow up. Not having a criminal record obviously provides direct benefits to this group, while others benefit from not being the potential victims of crime. In short, the public benefits are even larger than the private benefits. As an example of the large potential payoff of noncore public investments, consider investments in high-quality early childhood education. It is now clear that anything with the potential to narrow school achievement gaps between low- and high-income children could significantly boost national productivity. McKinsey (2009) estimates that completely eliminating the achievement gaps between children of different income groups would boost national income by roughly $70 billion annually. The type of public investment most frequently invoked in debates over fiscal stimulus is core infrastructure investment. For example, infrastructure investments in the American Recovery and Reinvestment Act (ARRA) were key to gaining support for enacting ARRA. Human services investments (such as child care and home health care) generate three times as many direct jobs as core infrastructure spending. This direct job advantage significantly erodes, but remains, once indirect jobs are factored in. (These jobs include “supplier jobs” supported in supplier industries and related service sectors, and “respending” jobs supported by wages in the new jobs created.). 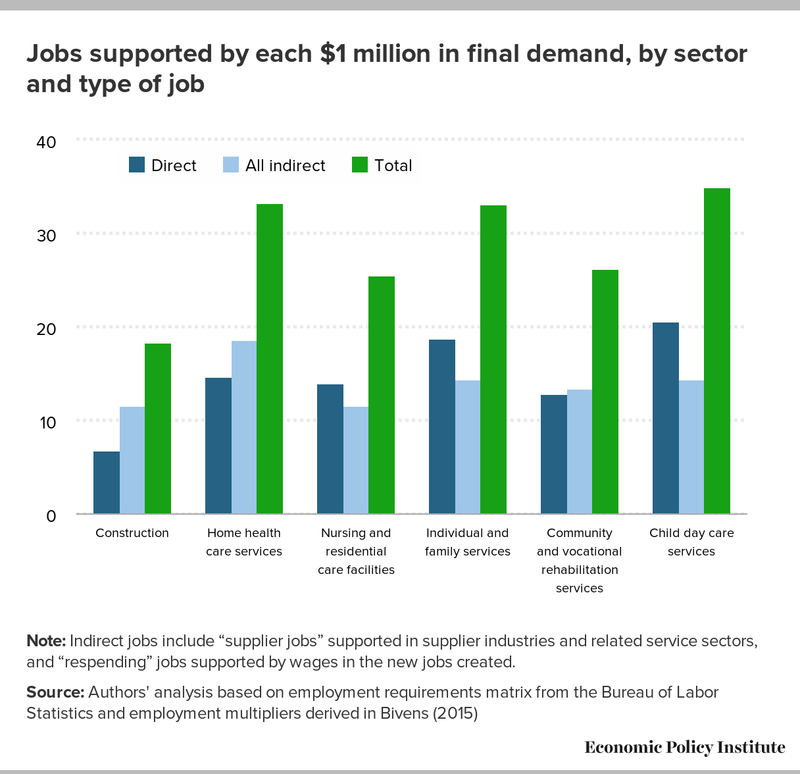 This is evident in Figure C, which compares jobs supported by construction (the industry mostly closely associated with core infrastructure spending) with jobs supported by various human services sectors. Though not shown in the figure, construction jobs tend to have higher respending multipliers compared with human services jobs, due to the higher wages paid to construction workers. One implication of this is that if investment in human services is accompanied by measures to ensure higher wages in human services, it would increase respending jobs enough to at least partly offset any decline in direct jobs caused by these higher wages. Note: Indirect jobs include “supplier jobs” supported in supplier industries and related service sectors, and “respending” jobs supported by wages in the new jobs created. Note: Employment statistics represent pooled data from 2009–2012. Supplier jobs include materials and k-input (capital-input) jobs; indirect jobs include supplier jobs and induced (respending) jobs. As Table 1 shows, of the 34,228 jobs supported by each $1 billion in child care spending, 60.0 percent are held by child care workers themselves. These child care jobs skew heavily towards women (who hold 94.5 percent of such jobs, versus 48.5 percent of all jobs economy-wide) and African American workers (17.7 percent of jobs, versus 10.9 percent economy-wide). These direct jobs are notably low wage, with 41.4 percent in the lowest wage fifth, and more than two-thirds (68.5 percent) in the bottom 40 percent of the overall wage distribution. However, when supplier jobs and jobs supported by induced spending are included, the share of total jobs accounted for by women shrinks from 94.5 percent to 73.7 percent, and the share accounted for by African American workers shrinks from 17.7 percent to 14.7 percent. 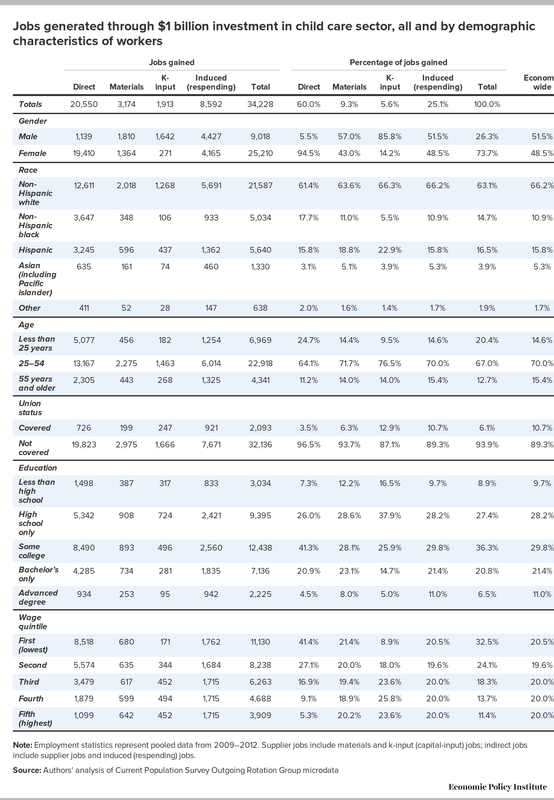 Table 2 shows that of the 17,785 jobs supported by each $1 billion in construction spending, only 37.5 percent are accounted for by construction workers themselves, with supplier and induced jobs accounting for a much bigger share of the total. Also, while direct construction jobs skew heavily male (90.5 percent) and Latino (27.7 percent, relative to 15.8 percent economy-wide), they also are more heavily unionized (15.2 percent relative to 10.7 percent economy-wide and to an even lower share in the private sector).12 Further, construction jobs are high-wage jobs: only 10.1 percent are in the bottom wage fifth economy-wide, and 70.2 percent of these jobs pay above the 40th percentile in the overall wage distribution. When supplier and induced jobs are considered, the total jobs supported skew significantly less male, with the share held by men falling from 90.5 percent to 72.4 percent. They also skew less Latino, with this share falling from 27.7 percent to 21.2 percent. The single most important finding of any public investment jobs analysis is that all forms of public investment have extraordinarily high bang-for-the-buck as job-generators compared with other forms of fiscal policy.13 And all forms of public investment would generate large long-run economic benefits. Additionally, a mix of “core” infrastructure spending and noncore investments, particularly in human services sectors, would provide jobs for a very wide range of workers. Finally, when assessing which groups are disproportionately benefiting from such investments, it is crucial to consider not only the direct jobs created but the total jobs created. It is crucial to note that the gains highlighted above assume that a policy change actually manages to produce net new infrastructure investment. This generally should be a straightforward proposition. Governments—federal, state, and local—have been financing infrastructure for decades, and it works. But the plans that President-elect Trump has issued so far are odd enough, along many dimensions, to cast doubt on any assurances of substantial net new investment. In fact, unless further clarifications and safeguards are included with these plans, they may lead to no net new investment at all, even as hundreds of billions of taxpayer dollars are spent. Even more concerning than the downside of real-world P3s is the fact that the Trump plan is not even a P3. It is instead, at least in its embryonic form, simply a way to transfer money to developers with no guarantee at all that net new investments are made. To see why, it is important to know what a textbook P3 would look like and what are the most common rationales for using them. P3s are long-term contracts between government and private companies to provide and finance infrastructure. They sit somewhere between standard public provision and full privatization of infrastructure. Say that a state or local government wants an additional road connecting two towns, but is constrained for some reason (usually by simple anti-tax politics) from raising the money itself to publicly finance the project. A crucial part of this process is that the democratically elected and accountable government ensures that the project is in the public interest. Having done this, the government can then negotiate with private financiers and developers to get the project built. Sometimes, investors get tax breaks for purchasing bonds issued by the developer to finance the project. The developers receive a revenue stream of some kind in exchange for their investment, and this revenue can be used to pay back debt- and equity-holders in the project. Often this is an explicit user fee, such as a toll for using a road. P3s based on explicit user fees are clearly not going to facilitate investments in underserved communities that are unable to provide profitable revenue streams. In theory, this could be addressed with clever “shadow user fees,” such as minimum revenue streams guaranteed by the public partner. But such alternative mechanisms raise numerous new questions of corruption. For example, who makes sure that these minimum revenue streams are fair and only pay for the value of the infrastructure, as opposed to just constituting pure giveaways to private profiteers? Supporters of P3s allege that they add profit incentives to support infrastructure provision. Theoretically, this profit motive could filter out so-called “bridges to nowhere” that politicians approve to get votes or curry favor, because a private partner will actually want an economic return on investment. In a well-managed P3 in which infrastructure operators face some competition, the private partner is also expected to weigh the long-term costs of deferring maintenance, specifically the loss of users and their fees if the quality of the infrastructure deteriorates quickly. This could lead to better maintenance and repair, particularly if political incentives reward breaking ground on new projects (ribbon-cutting ceremonies) over the unglamorous work of maintenance and repair on existing assets. And to the extent that there is competition, it could lead to more efficient pricing as users pay the costs of infrastructure (though, as always, simple efficiency should not be the sole criteria of policymakers). As noted before, however, much standard infrastructure provision is characterized by economies of scale that lead to natural monopolies. So, even “private” operators in P3s will likely have to be tightly managed and regulated, and the hand-waving benefits of “competition” are unlikely to appear (monopoly is, by definition, absence of competition). In short, even textbook P3s are not some shortcut around the need for government to be effective and well-run. Or the private partner may ramp up prices (user fees) or reduce the service quality to cut costs and maximize profits. Since so much infrastructure has the character of a monopoly, customers are not free to just switch to other providers. Another issue with real-world P3s is renegotiation. Private companies have incentives to engage in opportunistic renegotiation. Such renegotiations reverse all of the benefits of ever engaging the private sector in infrastructure provision and financing. Take, for example, the case where a P3 toll road is built, but traffic is lighter than forecast, so revenue disappoints. The private operator might try to renegotiate higher tolls or even minimum revenue guarantees from a public partner. The international evidence on P3s suggests that renegotiation is a major problem.16 Private partners tend to initiate a renegotiation fairly quickly, and they tend to get bailed out when they run into financial problems. Most of the time, these bailouts occur due to the poor performance of the private sector in forecasting the revenue stream of say, a toll. In short, the use of P3s to make infrastructure investments without the whole endeavor turning into crony capitalism depends heavily on strong regulation and the willingness to not renegotiate and bail out the private partner when it fails. Frankly, this would raise alarm bells about the incoming Trump infrastructure plan even if it was a simple P3. But the Trump infrastructure plan is not just a simple P3. Instead, the details released so far indicate only that it is a plan to give tax credits to private financiers and developers, period. Specifically, Trump’s plan is to provide a tax credit equal to 82 percent of the equity amount that investors commit to financing infrastructure. The lack of further details and clarification is daunting and raises all sorts of questions. Who decides which projects need to be built? How will the Trump administration provide communities with needed infrastructure investments that are unlikely to be profitable for private providers (for example, lead-free water pipes in Flint, Michigan)? Are investors in already existing P3s eligible for the credit, or is it restricted to new investment? If private investors in already existing P3 arrangements are eligible, how do we ensure these (not cheap) tax credits actually induce net new investments rather than just transferring taxpayer largesse to operators of already existing projects? If we assume tax credits will be restricted (on paper, anyhow) to just new investment, how do we know the money is not just providing a windfall to already-planned projects rather than inducing a net increase in how much infrastructure investment occurs? To be fair, even well-planned infrastructure initiatives—such as the aid to state and local governments for infrastructure investment in the American Reinvestment and Recovery Act (ARRA)—can theoretically simply crowd out already-planned investment instead of creating net new investment on a dollar-for-dollar basis.17 But a tax credit for private-sector provision introduces an additional complication. Instead of getting net new investment, states and localities may just change how they will finance the infrastructure investment they have already planned. Trump’s plan frames the infrastructure problem as a lack of innovative financing options. This is nonsense. The problem is that politicians don’t want to ask taxpayers to pay for valued infrastructure. But, even in P3s, these taxpayers do pay. They just pay “user fees” or “tolls” to private entities rather than “taxes” to government. Thinking that the former is clearly superior is pure ideology. After all, nothing in theory really stops governments from financing infrastructure directly and paying for it with their own tolls and user fees. In fact this happens all the time. But too often it is simply assumed that bringing in the private sector is always and everywhere more efficient and innovative. This is false. And this ideology-based outlook will lead to plans that radically reduce—and may even totally erase—any net new investment actually induced. The long game regarding the public investment agenda should be to boost public investment levels permanently. A new research literature has bolstered claims that public investment can help long-run growth. At the same time, macroeconomists are increasingly concerned that secular stagnation may well mean that private investment will be insufficient to keep the economy pinned at full employment in coming years. To maximize the aggregate demand benefits of a permanent increase in public investment while allaying concerns over deficits, this permanent increase could be funded with progressive revenue sources. Any infrastructure-investment effort should certainly not be “funded” with one-time tax gimmicks that do not actually raise revenue over the long run. Corporate tax reform (often identified as the most likely potential source for financing infrastructure investments in the near term) should focus like a laser on boosting revenue in the long run and ending the deferral loophole in the corporate income tax code. Everything else is largely a distraction from this larger effort. Gimmicks that lead to long-term losses—such as a “repatriation holiday”—should be off the table. Finally, promises that a free lunch can be had by relying heavily on private investors for infrastructure should be viewed skeptically. Tax credits dangled to entice private financiers and developers to provide infrastructure provide no compelling efficiency gains and mostly just open up possibilities for corruption and crony capitalism. Josh Bivens joined the Economic Policy Institute in 2002 and is currently the director of research and policy. His primary areas of research include mac­roeconomics, social insurance, and globalization. He has authored or co-authored three books (including The State of Working America, 12th Edition) while working at EPI, edited another, and has written numerous research papers, including for academic journals. He often appears in media outlets to offer eco­nomic commentary and has testified several times before the U.S. Congress. He earned his Ph.D. from The New School for Social Research. 1. We use potential GDP as the denominator to keep steep economic downturns (such as the Great Recession) from boosting our measure of public capital stock. The capital stock is the result of cumulative years of public investment and hence provides an excellent measure of the payoff of public investment efforts. 2. The share of corporate income received by workers in the form of wages and benefits fell sharply during the recovery from the Great Recession and is at its lowest point in decades, signaling that workers have not regained the bargaining power necessary to secure wage increases. See EPI’s nominal wage tracker http://www.epi.org/nominal-wage-tracker/ for data on both nominal wage growth as well as data on the shift from labor compensation to corporate profits. See Bivens (2015) for the argument on why a healthy nominal wage target for today’s American economy should be something like 3.5 percent to 4.5 percent for the next couple of years. 3. The biggest difference between public investment as near-term boost versus public investment as a long-term growth strategy is how it is funded; see Bivens (2014) on this point. The short-term stimulus benefits of public investments are maximized if they are funded with debt. They are almost totally neutralized if they are funded by cuts to other government spending, including transfer programs. The stimulus benefits are attenuated, but still present, if funded with broad-based taxes. Finally, funding public investment with progressive revenue sources would still deliver considerable stimulus benefits (roughly two-thirds as much as financing with debt). 4. See Summers (2016) on the case for worrying about secular stagnation, and why a higher level of infrastructure investment would be a well-targeted response to such worries. 6. See Bivens (2012a) for evidence on the estimated high rates of return for core infrastructure investments. 7. See Bivens (2012b) for evidence on the estimated high economic returns of increasing noncore public investments. 8. See Whitebook et al. (2001) on why higher compensation is needed to boost quality in the child care sector. 9. See Bivens et al. (2016) for estimates of how one model child care policy (capping families’ expenditures on child care at 10 percent of family income) could boost participation of women in the labor force. 10. See Hoynes, Schanzenbach, and Almond (2014) on the long-run health benefits of childrens’ exposure to nutritional assistance. See Brown, Kowalski, and Lurie (2015) on the potential economic returns to childrens’ exposure to health insurance coverage. 11. See Bivens (2011) on the agreement among both public and private forecasters on the relative efficiency of different forms of fiscal stimulus. 12. Given well-known problems in disaggregating the construction sector into residential versus commercial construction, it is possible that commercial construction (which would be the subsector boosted by infrastructure investments) might employ lower shares of Latino workers than either the residential or the overall sectors. Residential construction accounts for roughly half of the total sector, so a large overrepresentation of Hispanic workers in that subsector could drive up their share in the overall sector, leading to overstatements of how many Hispanic workers would be supported by an increase in infrastructure investment. Bivens (2014) tried to account for this possible bias, but found little evidence that it was large enough to detect. Conversely, Bivens (2014) did find that the share of unionized workers is much higher (high enough to detect) in the commercial sector, so the share of jobs supported by infrastructure that are unionized is certainly larger than Table 2 indicates. 13. Recent retrospective assessments of the American Recovery and Reinvestment Act (ARRA) find extraordinarily powerful job-creation stemming from its increases in both core infrastructure (see Wilson (2012)) and noncore public investments (see Chodorow-Reich et al. (2015). 14. See Blunt (2016) for an example of a P3 gone wrong. 15. See Engel, Fischer, and Galetovic (2014) for details on this project and other instances of P3s going badly. 16. See Engel, Fischer, and Galetovic (2014) on this international evidence. 17. For the record, research shows the ARRA investments worked very well, with substantial net new investment created. On this, see Leduc and Wilson (2015). Aschauer, David A. 1989. “Is Public Expenditure Productive?” Journal of Monetary Economics, vol. 23, no. 2, 177–200. Aschauer, David A. 1990. “Does Public Capital Crowd Out Private Capital?” Journal of Monetary Economics, vol. 24, no. 2, 171–88. Aschauer, David A. 2000. “Public Capital and Economic Growth: Issues of Quantity, Finance, and Efficiency.” Economic Development and Cultural Change, vol. 48, no. 2, 391–406. Bivens, Josh. 2011. Method Memo on Estimating the Jobs Impact of Various Policy Changes. Economic Policy Institute Report. Bivens, Josh. 2012a. More Extraordinary Returns: Public Investments Outside of “core” Infrastructure. Economic Policy Institute Briefing Paper #348. Bivens, Josh. 2012b. Public Investment: The Next ‘New Thing’ for Powering Economic Growth. Economic Policy Institute Briefing Paper #374. Bivens, Josh. 2014. The Short- and Long-Term Impact of Infrastructure Investments on Employment and Economic Activity in the U.S. Economy. Economic Policy Institute Briefing Paper #374. Bivens, Josh. 2015. A Vital Dashboard Indicator for Monetary Policy: Nominal Wage Targets. Center on Budget and Policy Priorities report. Bivens, Josh, Emma Garcia, Elise Gould, Elaine Weiss, and Valerie Wilson. 2016. It’s Time for an Ambitious National Investment in America’s Children: Investments in Early Childhood Care and Education Would Have Enormous Benefits for Children, Families, Society, and the Economy. Economic Policy Institute report. Blunt, Katherine. 2016. “The End of the Road.” San Antonio Express-News, September 16. Brown, D., A.E. Kowalski, and I.Z. Lurie. 2015. Medicaid as an Investment in Children: What is the Long-Term Impact on Tax Receipts? National Bureau of Economic Research Working Paper No. 20835. Bureau of Economic Analysis. National Income and Product Accounts Table 1.1.5 and Fixed Assets Table 7.1.A. Bureau of Labor Statistics. 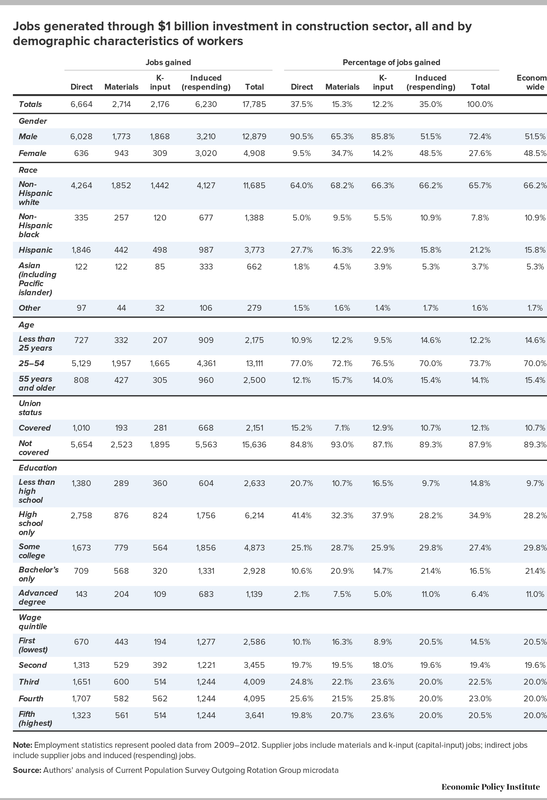 Employment requirements matrix data tables from the Employment Projections program. Bureau of Labor Statistics. Unpublished series on total economy productivity—available upon request. Chodorow-Reich, Gabriel, Laura Feiveson, Zachary Liscow, and William Gui Woolston. 2012. “Does State Fiscal Relief during Recessions Increase Employment? Evidence from the American Recovery and Reinvestment Act.” American Economic Journal: Economic Policy. vol. 4, no. 3, 118–145. Engel, Eduardo, Ronald Fischer, and Alexander Galetovic. 2014. The Economics of Public-Private Partnerships: A Basic Guide. New York: Cambridge University Press. Gould, Elise. 2015. Child Care Workers aren’t Paid Enough to Make Ends Meet. Economic Policy Institute report. Heintz, James. 2010. “The Impact of Public Capital on the U.S. Private Economy: New Evidence and Analysis.” International Review of Applied Economics, vol. 24, no. 5, 619–32. Hoynes, Hilary, Diane Schanzenbach, and Douglas Almond. 2014. Long Run Impacts of Childhood Access to the Safety Net. National Bureau of Economic Research working paper. Leduc, Sylvain, and Daniel Wilson. 2015. Are State Governments Roadblocks to Federal Stimulus? Evidence from the Flypaper Effect of Highway Grants in the 2009 Recovery Act. Federal Reserve Bank of San Francisco working paper. Navarro, Peter, and Wilbur Ross. 2016. Trump versus Clinton on Infrastructure. Summers, Larry. 2016. “The Age of Secular Stagnation.” Larry Summers website, February 15. Wilson, Daniel J. 2012. “Fiscal Spending Jobs Multipliers: Evidence from the 2009 American Recovery and Reinvestment Act.” American Economic Journal: Economic Policy, vol. 4, no. 3, 251–282.